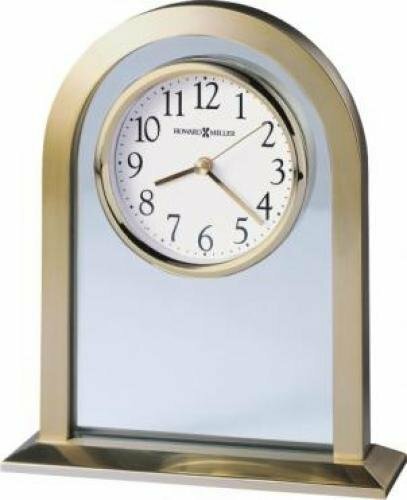 This sleek table clock features a brushed and polished brass tone finished metal arch with a glass center panel and a “floating” dial. The base is beveled with a polished brass finish and a brushed top surface. The dial is white with black Arabic numerals, and brass hour, minute and second hands. A polished brass tone bezel and glass crystal completes the elegant look. 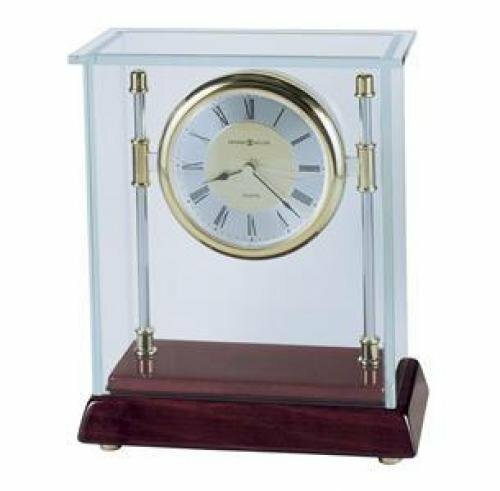 7 1/2" x 6 1/4" x 2"
A dramatic glass bracket case gives this clock its grand appeal. 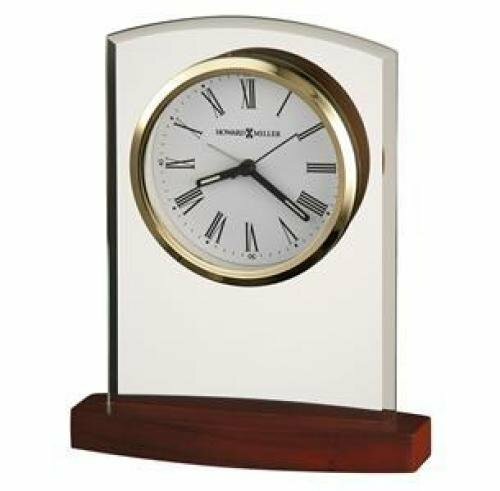 Polished chrome-finished pillars rise from a high-gloss Rosewood Hall finished base to frame the brushed brass-tone dial. A polished gold-tone bezel, silver, diamond-cut numeral ring, black hour and minute hands, a brass second hand, and black Roman numerals add to the polished appearance. 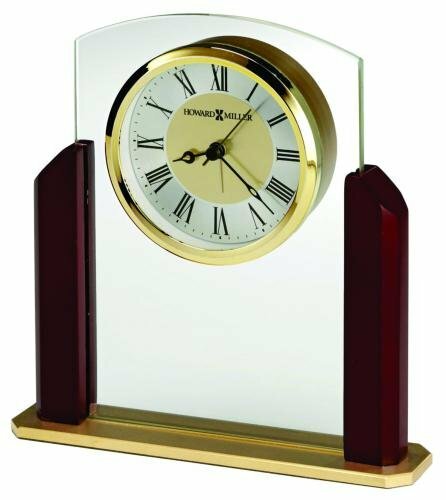 8" x 6 3/4" x 3 1/4"
Glass alarm clock with Satin Rosewod Hall finished sides atop a base plate. Features a contemporary white dial with black numerals, polished silver-tone accents, black hands and silver alarm hand that sits behind flat glass crystal. Quartz, alarm movement. 7" x 6 3/4" x 1 3/4"
Finished in high-gloss Rosewood Hall on select hardwoods and veneers. 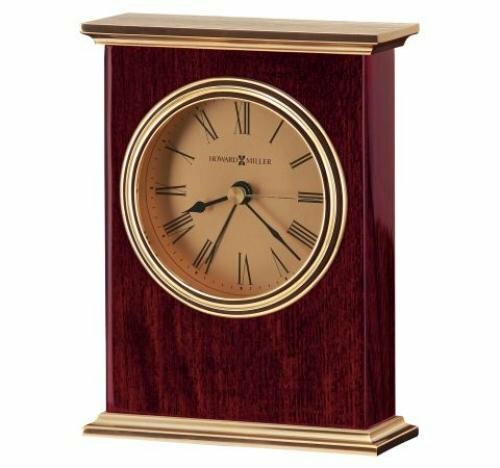 This carriage style alarm clock offers a brass-finished metal top and base. Gold-tone dial features a polished brass-finished waterfall style bezel, black Roman numerals, hands with brass second hands and alarm hands, and a glass crystal. 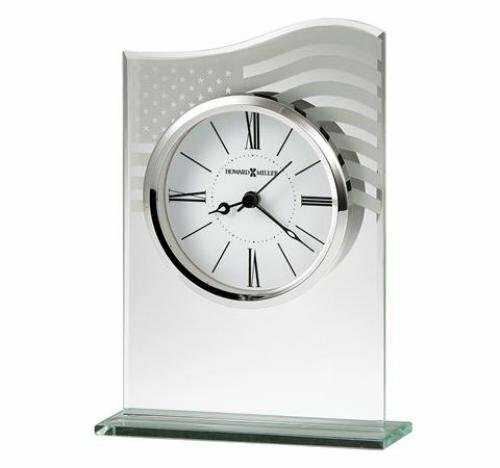 5 1/2" x 4 1/4" x 1 1/2"
This patriotic beveled glass tabletop clock is supported on a beveled, glass base and features a sweeping top that is etched with a U.S. flag design. The white dial is suspended within the glass and offers black Roman numerals and hour markers; black hour, minute and second hands; a silver alarm hand; and a glass crystal surrounded by a polished silver-tone bezel. This handsome, silver-finished arched alarm clock features a solid aluminum case with polished beveled sides and a brushed aluminum base with beveled and polished sides and edges. White dial with contemporary black Roman numerals and hour markers; black hour and minute hands; silver second and alarm hands; and a glass crystal surrounded by a polished silver-tone bezel. A full felt bottom protects your desk or tabletop. 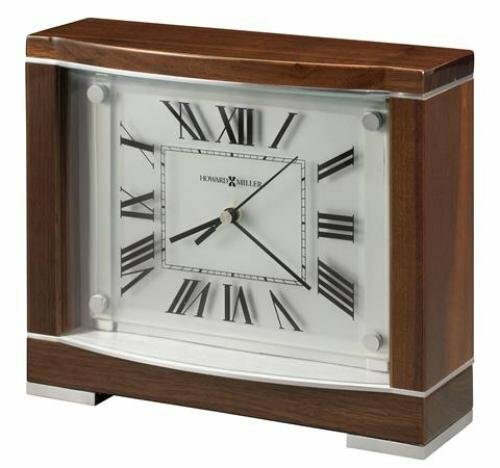 5 3/4" x 5 3/4" x 1 3/4"
Designed by Ty Pennington - This sofa table clock, which stands over 22" tall, is part of the Ty Pennington Collection and makes a statement on any sofa table. Curved molding frames the convex glass pendulum window in the front panel, which reveals the circular spun antique brass finished pendulum. Antique dial with aged black Arabic numerals, black spade hour and minute hands, convex glass crystal, and features Ty Pennington's signature. 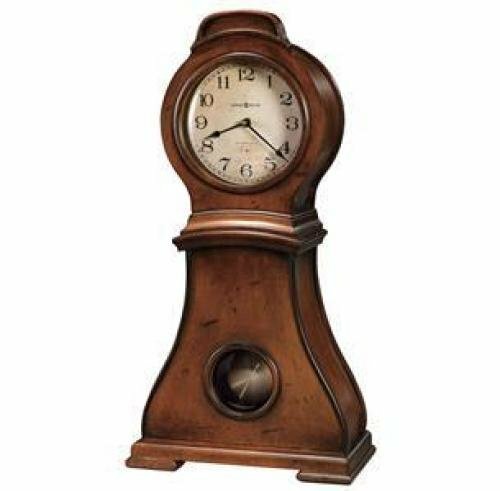 22-1/4" x 11-1/2" x 5-1/2"
The crisp white dial of this alarm clock is suspended within a beveled glass modified arch mounted on a satin rosewood finished base. A polished gold tone bezel surrounds the white dial and contemporary Roman numerals and hour markers, and a glass crystal. Black hands are featured with luminous inserts. 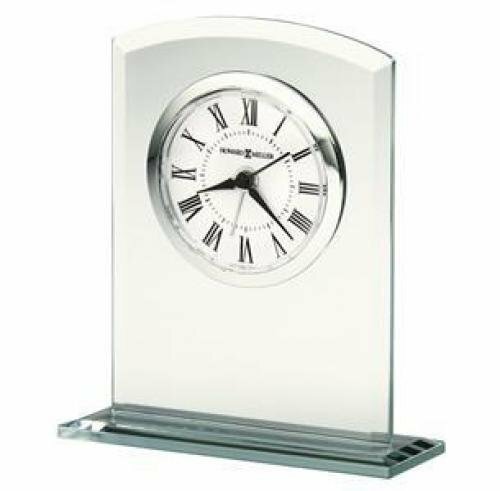 6 3/4" x 5 1/4" x 1 1/2"
The dial is suspended within the curved, beveled glass of this tabletop clock, which sits on a beveled glass base. The white dial features black Roman numerals and tic marks, a polished silver-tone bezel, and a shatter-resistant convex crystal. 4-3/4" x 4" x 1 1/2"
Piano Walnut finish on select hardwoods and veneers. Features a curved front, two brushed aluminum panels with polished sides, and polished aluminum feet. A glass dial, with black Roman numerals and a frosted center, sits in front of a satin silver background and black hands. The dial is attached to the case by polished aluminum finished bar supports with polished aluminum caps. 8" x 9" x 3 1/2"